Call us at (401) 351-7378 to schedule your in-home consultation today. With over 80 years of experience and a real focus on customer satisfaction, you can rely on us for all of your heating maintenance and repair services. We provide a professional maintenance and installation services and are available 24/7. Would a ductless mini split system work well for your Rhode Island area home or business? Ductless air conditioners and heaters provides a space-saving and budget-conscious heating and air conditioning that can benefit any type of building. If you live in Rhode Island, Massachusetts, or Connecticut, you know that the winters are cold and the summers are hot, and old style window unit air conditioners are very expensive to run. Ductless mini split air conditioners and heaters are extremely quiet and energy efficient and provide an excellent solution for comfort year round. The compressor for the unit is mounted outside, so that the experience inside is pleasant and without that awful constant hum that window air conditioners are infamous for. The interior wall ductless mini split units come in a variety of sizes, colors and configurations. There is something to suit everyone. 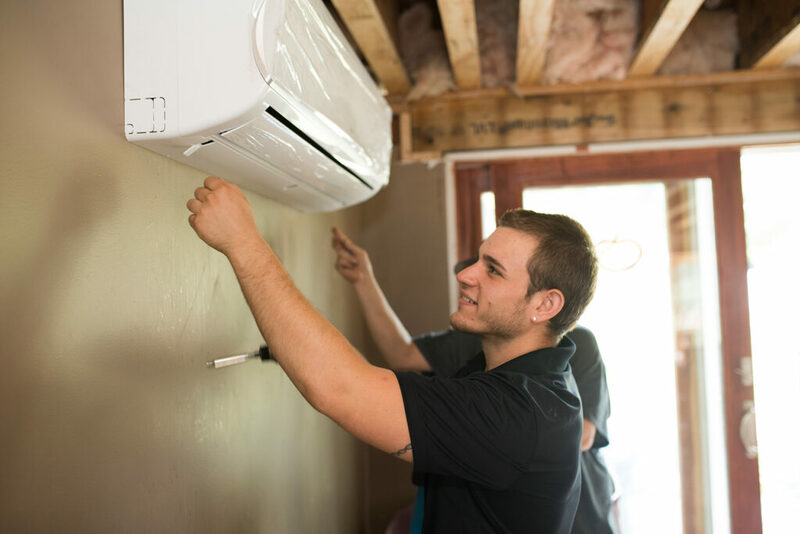 Additionally, ductless mini split installation in Rhode Island is quick, and less invasive than the installation of ducting. Contact Restivo’s today for your free estimate for ductless mini split installation in Rhode Island and surrounding areas. What is the difference between mini splits and ductless air conditioning units? The terms “mini splits” and “ductless systems” are interchangeable, and the technology has progressed way beyond the standard set up of the wall unit inside and compressor outside. Combined with heat pumps, there are many configurations available that mean endless possibilities for the best heating and cooling experience in your home or commercial property. What kind of building or situation are ductless air conditioning systems best for? Mini splits and ductless heating and cooling systems are beneficial for any kind of building. Many times we are hired to retrofit systems to a building that was not originally fitted with duct work, and that’s where these systems really shine. We have installed ductless heating and cooling in churches, funeral homes, convenience stores and of course residential homes. Is it possible to have more than one zone with a ductless air conditioning and heating system? Yes, some models support up to 12 different zones. Do all ductless air conditioners heat and cool? No, not all models do both heating and cooling. The highest rated ductless mini splits do both heating and cooling. These are our top selling models and we highly recommend considering a unit that does both. They can also tie in to an existing ducted system, along with an air source heat pump. We also offer ceiling cassettes, low wall units, ducted units, ductless units and full size air handler/coil cabinet units to tackle any situation. Yes, but ONLY the dual heating and cooling mini split systems that have heat pumps qualify for rebates. AC only mini splits will not qualify. Are mini split systems good at heating even in really cold climates? Mini splits can almost always be a possibility if the correct equipment is used, even in cold climates. In this area we recommend choosing the models that are specifically designed to work best no matter the weather. LG calls this class LGRED, for really extreme degrees. Mitsubishi calls it Hyper Heat. What kind of warranties come with the units? Restivo’s is proud to be an LG Excellence Dealer and a Mitsubishi Diamond Contractor Preferred. 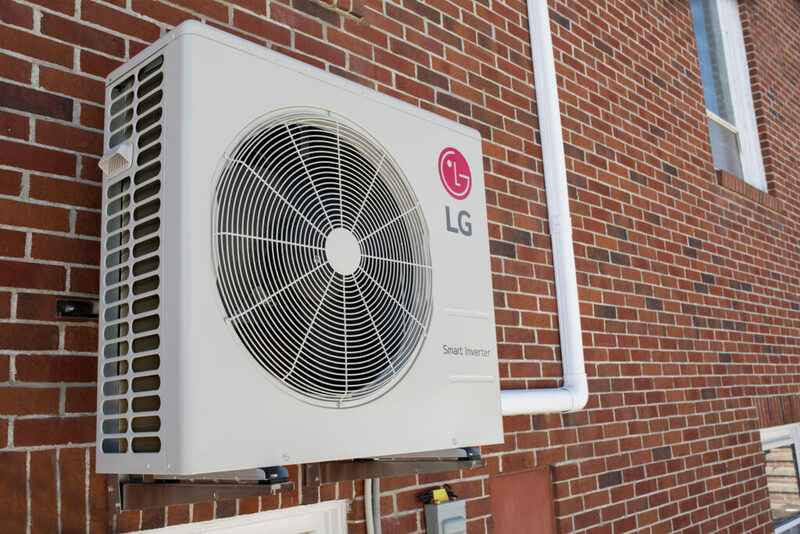 The high standing with both companies means that we are able to offer exceptional warranties on LG and Mitsubishi products, like a 12 year parts warranty, and a 12 year compressor warranty for both brands.